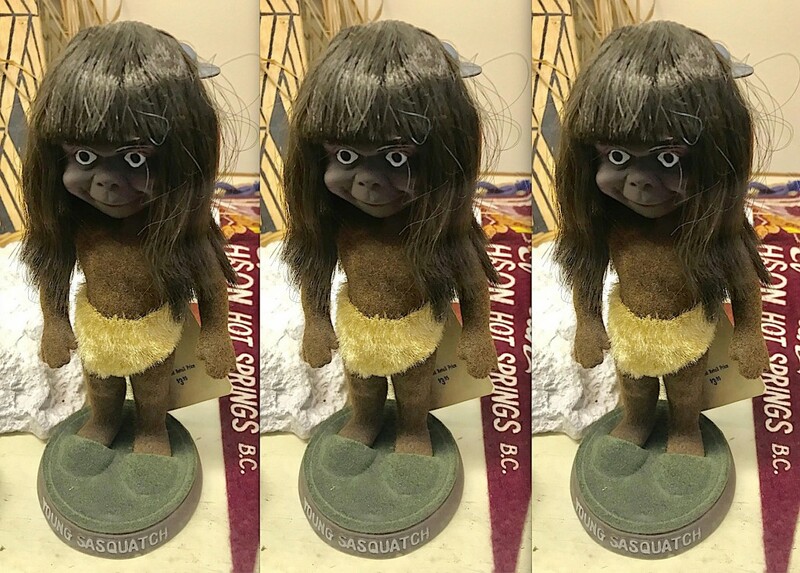 British Columbia, circa 1940s, “Young Sasquatch” tourist art. 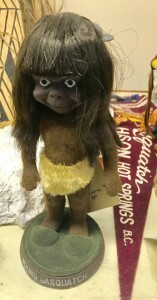 On exhibit, International Cryptozoology Museum, Portland, Maine. This happens to be the very familiar case of “Charley Victor,” a British Columbian First Nations elder (as in elder man, not necessarily an Elder on the Skwah reservation). So, let’s start there. Here we have a Native account from before 1914 that was translated into Canadian English in 1929 and 1940 by Burns, again before 1978 by Green, that was then translated into Italian and/or Spanish in 1979 by Renzo Cantagalli, and then translated again recently by Romero? Do you think there might be some items lost in translation? As I mentioned, the Charley Victor story is quite easily obtainable in English, MacLean’s Magazine is available, and there’s no reason the story had to be pulled out of the ether by this torturous route. It has caused some errors in the story which are then used by Romero, apparently, to create details that support their point-of-view. Charley Victor, an old man, tells of an encounter with a young (perhaps) white Sasquatch or a white boy (you pick) and an older black-skinned female Sasquatch that talks to him. 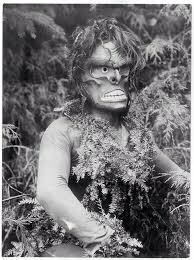 In the context of 1914-1924, it should be pointed out that British Columbian First Nations people saw the “Forest Giants” as a co-existing group of Giant Indians who talked to them. ~ Victor is instantly paralyzed from the encounter. Victor mentioned one phrase he heard over and over, which he translated as “Yahoo. 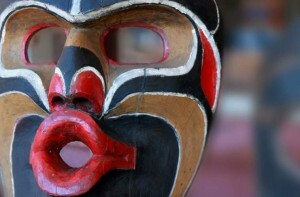 Yahoo.” He also notes he felt he heard one sentence in his Douglas dialect. Certainly, Romero and (perhaps, perhaps not) the coauthors of the new book have made this leap. If one starts with messy re-tellings of a story, should we be surprised with a conclusion that there’s an underlying paranormal “curse” occurring? Hey, “high strangeness” exists, but so does ethnographically gathered story-telling that needs to be properly recorded. And judged in the temporal context of when it was collected. Update: When this was posted on January 29, 2019, it stirred some folks up on Twitter. A few people took my critique personally. Let me say, my insights were about the research that lead to some conclusions that I felt were reached too quickly without looking back at earlier sources. The game of “telephone” was played with this case, when it wasn’t necessary. I wasn’t talking about people, as I highly respect Romero’s work, and the others linked to this case. They can use cases, if they are thoroughly researched and clearly detailed in any way they want. And they should. Heck, I had a whole chapter in my 2003 Bigfoot book on “high strangeness,” because they are not to be ignored. But I think claims based on any stories and linkages need to be based on significant details that are really in the stories. “Facts” that slipped in due to missed translation need to be called out for what they are. Simple mistakes. Then there’s the myth-making conclusions too, about “curses.” Those are to be straight-forwardly dealt with too. Soon after John Green died in 2016 (see obit here), I re-examined the “Sasquatch Death Curse” that I first wrote about in one of my Bigfoot books. In early 2002, a rumor spread on the Internet that “Roger Patterson died not long after his encounter” of October 20, 1967. Or those that were involved with the 2001 Skookum cast might be star-crossed, after the deaths of Dr. LeRoy Fisher and Dr. Grover Krantz. Is there any reality to this sense of bad luck, death, seeing or even studying Bigfoot? The Patterson-Gimlin film footage was taken in October 1967; Roger Patterson died in January 1972. The Skookum cast was found in 2000, and Fisher and Krantz died in 2002. The Chapmans had their sighting in 1941 and died in 1959–about 18 years later – although the point Sanderson was making is that relatively soon after he interviewed them they died. The folklore lives on. Mizokami, of course, extended this folklore into the modern world. People die. It is part of the human condition. In actuality, there is no “Sasquatch death curse.” There is only sadness that we have no control of when death occurs. And that someone has moved on. John Green got involved in serious Sasquatch research in 1956. He died 60 years later. The “Bigfoot curse” never touched him, except in a positive fashion. You write that I wrote my article at TDG via my “friends and colleagues Josh Cutchin and Tim Renner’s upcoming book.” I would like to clarify the guys are currently in the process of writing the manuscript, of which I have not seen any portions of. “How we get to the story is so contoured, it is amazing it makes any sense.” What can I tell you? The way that I first ran into the story was by reading that Spanish translation of that obscure Italian book, many MANY moons ago. It’s a story I mentioned on one of our regular Where Did the Road Go? round tables, which is why Josh asked me to dig it out. Any ‘errors’ made on the article are mine alone, along with the opinions expressed on it. I wrote about the case to illustrate the kind of cases and stories Josh and Tim want to focus on on their book. 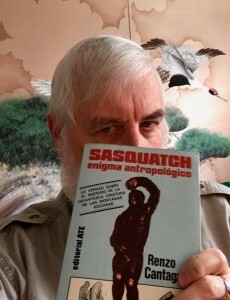 Since Josh asked me for the translation and to give him the details of the Cantagalli book, I felt it was a good ‘tease’ for any readers interested in unconventional approaches to Cryptozoology –and I’m sure the rest of that book’s references will be more kosher and less convoluted. You say “the Charley Victor story is quite easily obtainable in English,” and would always defer to your expertise over such matters. However, anyone who tries to make a cursory search of it online would find VERY few websites or books in which it is mentioned. One of those is Abominable Science by Daniel Loxton. I was actually surprised to find that my own friend Micah Hanks wrote about it very recently, and I linked to his article on Mysterious Universe. I am more than aware on the translation issues when it comes to an old article that was originally printed in Canada in 1929, then translated to Italian, THEN to Spanish and THEN back to English. I actually advised Josh to ask Micah for his sources instead on relying solely on my translation! However, like I said there aren’t too many websites that feature that story, and since my translation had a few more details than Micah’s, I thought it would be a good idea to share it with our Daily Grail listeners. In my Spanish copy of the Cantagalli book, the young creature Charley mistook for a bear is described as a teenage white boy. Micah Hanks’ article also coincides with this. So –according to my copy– the only Sasquatch Charley ever saw was the female. You write Charley found the Sasquatch “in a cave.” In my copy Cantagalli wrote it was a tree that had a hole a few meters above ground. In his article Micah wrote that Charley did find a cave where the tribe elders said the “forest giants” lived, but apparently that was an earlier, separate event when Charley was younger. I omitted this element in my own article for the sake of brevity –it was already TL:DR for today’s standards. You write that “there’s no Sasquatch curse.” From an Anthropological point of view that is a very rushed judgement, since several Native American groups do believe these creatures are bringer of bad omens, so from a folkloric standpoint, there IS a Sasquatch curse –just like there is a ‘Tutankhamun curse.’ Now, whether there is any OBJECTIVE validity in these two curses, that’s another thing entirely… that is why I support Jeffrey Kripal’s ideas about “making the cut” and applying Phenomenology and other tools used in social sciences. In his description of the boy, Charley said that his hair was black and woolly. Wounded and bleeding, the poor fellow sprawled upon the ground, but when I drew close to examine the extent of his injury, he let out a wild yell, or rather a call as if he were appealing for help. From across the mountain a long way off rolled a booming voice. Near and more near came the voice and every now and again the boy would return an answer as if directing the owner of the voice. Less than a half-hour, out from the depths of the forest came the strangest and wildest creature one could possibly see. The old hunter felt sure that the woman Indian looked somewhat like the wild man he had seen at Yale many years before, although the woman was the darker of the two. He did not think the boy belonged to the Sasquatch people, “because he was white and she called him her friend,” reasoned Charley. “They must have stolen him or run across him in some other way,” he added. But, in Loren’s defense, this section of the story has the contradictory section-headline of “Charlie Shoots a Sasquatch Boy.” Despite the narrative not describing that, the section headline is as clear as mud. Anyway, that’s my $0.02 – but it’s a weird story. I just can’t squeeze a white sasquatch out of the narrative and don’t trust that headlines are any more accurate in 1929 than they are now. Which is to say, not very. Hopefully, this comment will help provide clarity and not further obfuscate the matter.